Unemployment is a one of the most challenging phases of life. It not only affects day to day routine and takes a toll on your financial well being, but also affects mental health to a great extent. If you’re the breadwinner and have a family, you will know the pain joblessness causes. Thankfully in the US, we have a well laid out Unemployment Insurance program that provides up to 26 weeks of unemployment compensation to those who lose their job due to involuntary reasons. This system is jointly administered by the Federal – State set up with funding that is drawn from various sources and includes contribution by the employer on behalf of the employee. To facilitate and administer a well maintained compensation system for unemployed citizens, the Federal Unemployment Tax Act(FUTA) has authorized the IRS(Internal Revenue Service) to collect annual taxes from the employer which is later pooled and routed to State Unemployment Agencies for the purpose of funding exclusive UI programs run by each state. Each of the 50 states along with District of Columbia, Puerto Rico & U.S Virgin Islands run their own unemployment insurance programs with dedicated authorities in accordance with the prescribed rules by the United States Department of Labor. Up to 6 months of regular Unemployment Benefits are paid out to the salaried class who’re out of work due to involuntary reasons such as Layoffs. However not all jobless claimants qualify for the dole. Workers such as Contracted & Seasonal along with Church employees are not generally eligible due to some obvious reasons. The most important reason being, non-payment of unemployment taxes into the system which naturally makes workers in this industry, ineligible. As a leading forum for unemployed workers in the country, we get a good number of questions from jobless church workers who are curious to know if they qualify for the weekly monetary compensation from the government. A straightforward answer to those laid off from employment in churches is that you do not qualify to receive unemployment compensation simply because churches do not remit taxes that contribute to the corpus. However, there are exceptions. The alternatives have been explained in the next section. The root cause of church employees not being outrightly eligible for Unemployment Compensation is simply because churches and religious organizations are exempt from paying unemployment taxes that go as funds into the system as per specific clauses under Unemployment Insurance Act of 1935. Since Unemployment Laws are a state subject, nearly all states exempt churches from paying taxes on behalf of their employees that contribute towards relevant funds. This is the primary reason why church employees cease to qualify. However, if a church decides to have a policy in this regard where they pay unemployment taxes voluntarily, the employee can receive unemployment benefits after separation from the job. Around 13 diocese in the country voluntarily participate in unemployment programs administered by states by paying taxes through means of specific agreements with state labor authorities. 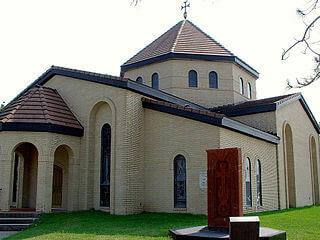 For example, The Richmond, Va., diocese voluntarily pays taxes in the state of Virginia to ensure temporary financial assistance for former employees. To overcome unavailability of unemployment benefits to church workers, some of them offer a severance package as a part of their Human Resource policy. Such an arrangement helps retrenched employees to manage loss of job for a certain period. A select few purchase employment insurance package through a private insurance to provide compensation. If you’re someone who works with the church and is being laid off or an acquaintance is facing this situation, be prepared since you will not qualify for state provided unemployment compensation. As a diligent worker, check with the church management or HR representative if there are alternative options that work in your favor. Otherwise, save up for the rainy day and work hard towards finding a job. It’s quite natural for a former church employee to scout for jobs in the government sector. Recruitment with government agencies is slightly different from that of private and corporate world. The competition is stronger since government jobs are most preferred by job aspirants. There are thousands of job openings in various government agencies, both onshore and offshore in other countries. Your approach towards job search in government sector should be different. Unemployment insurance in US provides temporary unemployment compensation to jobless citizens who are out of work, owing to lay offs. The weekly monetary benefit may not really compensate the job loss, but helps in managing basic household expenses while the claimant is looking for job opportunities. You can receive up to 26 weeks of unemployment benefits which is a chunk of your previously earned income. 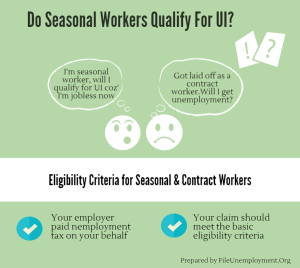 There are many myths associated with claiming unemployment compensation. Let’s unmask the most common myths surrounding eligibility and tell you why they are not. Seasonal workers are those who are employed during a particular season and remain jobless in the off season. Generally, no remuneration is provided to such workers during off season. Therefore, it becomes difficult for seasonal workers to manage finances during this time. There is a sense of chaos amongst seasonal workers and the submission is, seasonal workers do not qualify due to their obvious nature of job. In reality, some states do provide unemployment compensation during off period. 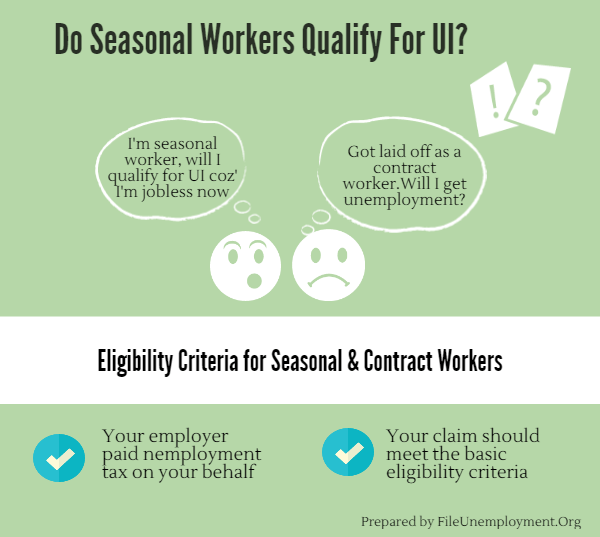 If your employer declares himself as a seasonal employer and pays unemployment taxes into the system, you can be eligible to claim the dole (unemployment benefits). Workers contracted for a specific period or from a third party agency are mostly eligible. Your employer is obligated to pay unemployment taxes to the state. Independent contractors are largely not eligible to claim unemployment as their monetary benefits from the company are limited. Contact your employer to get further details surrounding this. Probably, the most commonly misunderstood aspect of applying for unemployment. Typically, almost all the states in the country do not consider social security benefits and therefore you will still qualify for UI if you lost the job due to no fault of yours. You must be willing to work further and actively look for jobs. If you’re in such a situation, please check with your state before filing as a few of them do consider social security. They do. Unless you’ve voluntarily chosen to be a part time worker. There are millions of workers whose working hours are reduced intermittently, directly impacting the wages earned. There are cases where an employee is laid off on temp basis due to lack of work for an indefinite period without compensation. In both cases, you can claim monetary compensation for the minimum prescribed hours not worked in a week. Workers on full time rolls, currently working part time due to deliberation from employer, can claim weekly unemployment until the time they are working less hours. Remember, if you’re a designated part time worker, you may not be qualify to receive UI benefits. A worker whose employment is terminated due to grave issues such as performance, misconduct and other deliberate reasons do not qualify. This condition is one of the basic foundations to eligibility criteria. There are many exceptions to this condition. Let’s say you wrongfully fired due to a grudge of the management or you quit, unable to bear the harassment from your supervisor. In both these cases, you can apply and claims benefits, provided you’re able to prove otherwise in case of a dispute. If you feel, unemployment was wrongly denied, you always have an option to appeal by means of adjudication process, which calls for review. Well, not in all cases. Let’s say you lost the job and decide to go to school full time to study further or acquire a degree. Primarily, you will not be eligible as you’re unable to work during this time. However, there are exclusions. The labor dept in your state can extend compensation for a certain category of courses, like the ones that are vocational and skill based. If it was recognised or sponsored by the DOL, you can get unemployment compensation. Read more on how schooling affects unemployment benefits. fileunemployment.org is a leading unemployment compensation advisory site which provides merited resources that not only educates you, but also equips you with confidence to apply for and manage unemployment compensation claims. There are many such myths that have no merit. You must not panic or conclude. Always get an expert opinion or check with the labor authorities in your state. The Q & A forum on our website addresses a significant number of questions and issues relating to filing for unemployment compensation from two different states. Based on our detailed study, we have collated a list of most common issues that arise which are conflicting in nature. My regular benefits from state X have exhausted. Can I apply from state Y as I moved here? I was approved for 23 weeks of UI benefits that ran out in 2012. Can I reapply as I am unemployed again? I worked in state X and recently moved to state Y. Which state do I apply for UI benefits from? I work out of state X and live in state Y. I was laid off from my job recently. Where do I apply from? I earned income working out of state X & Y. What income do I show as I lost both the jobs? Let us summon these questions one at a time and discuss the dynamics surrounding it. In all these cases, we strongly recommend that you double check with the labor dept in your state before arriving at a decision or concluding purely on basis of this article. My regular benefits from state X has exhausted. Can I apply from state Y as I moved here? The unemployment insurance is a scheme administered and overseen by the US department of Labor. Each state disburses the payment in accordance with certain rules confined to it exclusively. You will be able to claim only once from a particular state. If one exhausts the benefits in state X and moved to state Y in search of job, they cannot apply or claim UI as it can be considered illegal and you can be tried for fraud under local laws. Remember, unemployment compensation is only disbursed for a certain allocated period, is not revolving in nature and generally non-transferable. I was approved for 23 weeks of UI benefits that ran out in 2012.Can I reapply as I am unemployed again? Let’s assume a classic case where an unemployed youth, Rob* was laid off from his job as a store manager at a local supermarket in December 2011 and he applied and was approved for UI benefits for 23 weeks. Rob claimed & received weekly monetary compensation from the labor department in his state for the whole of 23 weeks and he immediately found a job that matched his skills. Unfortunately, due to a new company policy, Rob was laid off from his newest job in May 2014.Now, he is again looking forward to monetary support and is contemplating on applying for UI whilst he is searching for jobs. Since he had earlier in 2012 claimed and received full benefits, he may not be eligible this time around. It would be wise for Rob to call and inquire if any benefits would be available before applying again. One must ideally be looking at applying from the state of last employment. Remember, your employer would have paid the taxes into the system that contributes towards UI funds in the state where they operate. Therefore, you must apply from the state where you were employed so that they expend compensation from these funds. Almost all states have an option of conveniently managing claims online or by phone so that you don’t have to physically visit their office. If you moved to a different state, it is advisable that you manage it electronically. This scenario is nearly similar to the previous one. As your employer would have paid into the state taxes from the state where you worked, you must file from the state where you were working. If you have wages from multiple states, you may file a combined wage claim. Contact the unemployment office in the state where you reside and they will inform you as to which state you must contact to file a claim. The state will then request wage information from other states where you have worked. The information will be combined to calculate a benefit that will be an accurate representation of all your employment for a particular period of time. Any attempt to open claims in multiple states simultaneously will eventually be discovered. States implement crossmatch procedures to locate individuals who file simultaneous claims in multiple states. Such filing methods are not permitted and may be considered fraud depending on the circumstance. However, contrary to the previous answer, incarceration is not likely unless the amount of fraud is a significant sum. Most unemployment fraud cases result in repayment of benefits received, a monetary penalty equal to benefits received, and a disqualification from receiving unemployment benefits for a designated period of time. If you’re a first time applicant, we strongly recommend that you check eligibility for unemployment benefits before applying. *The character of unemployed youth Rob is a fiction and is not a real person.